Urnex - Dezcal Home 4 Pack - Activated Descaler for Espresso Coffee Machines 1-Ounce ea. Coffee Maker & Espresso Machine Descaler. Non-toxic, biodegradable descaling powder. Espresso machines that are used at home environment require desclaing about every month. 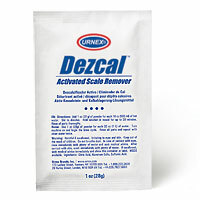 Dezcal Activated Scale Remover is specifically formulated to quickly and effectively descale the boliers and components of coffee and espresso machines. By removing mineral deposits which clog and impair your brewing equipment, Dezcal allows machines to perform at optimal levels while preventing scale built up and promote trouble free performance of your espresso machine. Non-toxic and bio-degradable, Dezcal is suitable for use by both professional technicians and home users alike. When used on commercial and "closed system" brewers (with a holding tank), special attention should be paid to rinsing. Contain: 4 portions of 1oz (28 g) Sealed Packets, each is enough for Monthly cleaning of any home Espresso machine. Ships in bulk. Verify compatibility to your equipment and directions in user manual under "descaling your machine". The instructions below are general instructions for information only. Professional Use: Add 1 oz (28 g) of powder for each 16 oz (500 ml) of hot water. Stir to dissolve. Hold solution in vessel for up to 30 minutes. Rinse all parts thoroughly. Home Use: Use 1 oz (28g) of powder for each 32 oz (1 L) of water. Turn machine on and begin the descaling cycle according to your equipment user manual. Rinse all parts and repeat with clean water twice.